Home / Card Tricks / What is the Double Undercut Card Sleight? What is the Double Undercut Card Sleight? easy to learn and also it looks more natural. at the top of the deck and give the appearance that you did not do anything. 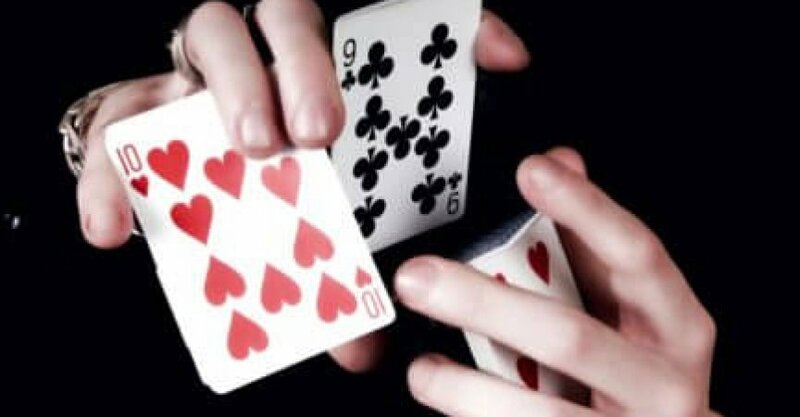 People use so many tricks to perform this easy card sleight as it is the most vital move should be in your collection. How the double undercut sleight look like when you performed it? Here you can learn how doing double undercut card, in case you are comfortable to hold a deck, then this move will not take much practice for you to grip on it. By pushing the card in the center of the deck you need to push it down slowly in this way you can separate it from the rest top half of the deck. simply make a gap and you should half the down half in order to get 3 piles, and then you need to control these from the top same like this. How easy this move is? This double undercut card move is pretty easy, you only need to watch this tutorial video in which you can see. You will master it in no time. What are the easiest tricks that involve this sleight? By using the trick, double undercut you can easily perform all those moves that you wondered in your childhood. Simply make viewers select a card, then put the card back into the deck. By using a double undercut, peek the card at the top. And simply give it to the audience and allow them shuffle as much as they want. Find out there card, These are the most Easy Card Tricks For kids used by many people. The Double Undercut is a fundamental technique for card control. It can be used to control a selected card to the top of the deck, or to secretly move a number of cards from the bottom of the deck to the top (and vice versa).